Our beautiful little girl is classified as a White Belly Hedgehog, her coloring is a melted milk chocolate with cream quills and her white belly. She also has a 'blaze' marking on her forehead, which to me, reminds me of Harry Potter's mark. She is our chosen one. Most of the time she is carried around by either my son or myself. One, because she is so spoiled that she expects to be given attention all day long, and two, she got chilled once and we have to keep a close watch on her body temperature. We just kiss her belly to see if it is slightly cold or not. Body heat does a good job of warming them back up, but your best friend for a hoggie that gets a little cold is an electric blanket. Just put a thin sheet over it and put the cage on top. It will keep the entire cage warm for them to lay on and play in. Get the ones that run for 10 hours and has many heat levels - you usually only need the bottom heat level or maybe the 2nd, but the 10 hours is important if you want to leave the house at all or sleep. Otherwise you have to check the 'throw sized' blankets every 3 hours. Just a note - the reptile electric heating rocks get too hot as a hedgie won't get off of it, they will get burns. And some heat bulbs make them act oddly, not sure why. Ours loves to sleep on polar fleece, old baby blankets, in hoodie pockets or a dirty t-shirt (pj tops without buttons are also good - buttons are a potential choking hazard) , also we use Kaytee's Clean & Cozy fluff since it doesn't get dusty or get stuck in their quills. All of it is cheap and they can sleep on fleece for almost a week - but put a litter pan under their wheel with fluff in it so you keep the cage cleaner. Then you only have to clean the wheel a few times a week and give a few foot baths. They can be potty trained either with a corner litter pan (make sure it isn't too tall for them to climb in and out of or they won't use it) or a designated place - like 1/2 cage fluff, 1/2 cage fleece - but then you have to get the fluff off the fleece before washing it. Shake it outside if possible - then you can really get the fluff off and it will help your dryer in the long run. Bath time is usually an easy enough experience. Keep the water level low and give them foot baths when needed and then a full bath won't have to happen very often. A full bath won't need to be in much water either, only an inch deep. We put ours in a small wash tub of warm water with a little Aveeno body wash in it, give them a quick wash, mainly focusing on the tummy and feet - check for dry skin before hand and wash those areas well with Aveeno too, but be careful around the face so you don't get it in their eyes. Also, reminder to keep away from their mouths if they are upset while in the bath. When they get scared, they will do what any animal will, and bite. Then I have a little warm water in a large cup plus some in the bottom of the bathtub to rinse them off with. Honestly, I was disappointed that neither of our hedgehogs like baths - so no floating hedgies in our tub, they run around and try to climb out. To dry them off, towels like a cotton dishcloth is perfect in size for them to be wrapped up in while they dry off and also you don't have the loops of a normal towel getting stuck on their quills on toe nails. Get all long hair out of a tub or off of any clothing you give them, it can wrap around their legs and cause them to lose circulation in them. We have talked to breeders who told us of hedgies getting hair wrapped around a leg then having to have it amputated because it wasn't found in time. Always be careful of the little things, for exotic pets, it means a lot. Feeding them is rather inexpensive too. They are what you would call an 'investment pet'. You pay the money up front when buying them - and please buy them from a responsible breeder to ensure they don't have Wobbly Hedgehog Syndrome!! - and the cage cost, buying a wheel (make sure it is solid all the way around so they don't break their legs or get hurt), a bag of high quality cat or kitten food, some fresh meal worms, and an extra large (chinchilla sized) exercise ball and after that, it is just maintenance for food and snacks. Sometimes you will have to replace a wheel or an exercise ball, but that is nothing compared to most pets yearly expenses. I recommend Blue Buffalo Rice & Chicken kitten food for babies and adult food for an older hedgie. It has the best amount of protein and the pieces are a good size. Saves you from breaking the pieces up or a hedgie choking on a piece. Odd shapes can be troublesome, a hungry hedgehog will really chow down like a dog does. Hedgehogs teeth do not grow back. Once they are gone, or damaged, that is it. So keep an eye on what they try to taste as a potential snack, ours tried to eat a rock that was in her digging play area. Never would have imagined her trying to eat it, but for some reason, our girl can't be trusted around any kind of rocks, so we switched to sand to let her dig in. Water is best in a bowl if you can get them to use it, bottles can chip their teeth. But a bottle is what most seem to like best. Also, make sure the water is Spring Water. Tap water has too many chemicals in it that is bad for them and Distilled Water causes liver problems. Never give them Distilled Water. We really love our little quill balls of love. They can be very cuddly so don't let the quills and huffs fool you. Some are very adventurous, so those you will have to keep an eye on more, we have also found that they are excellent escape artists. We throw worn t-shirts on floor and put out some food/water in places that they may have hidden if they got loose. But ours are so used to t-shirts and baby blankets that they go to what they know - things that smell like their owners or from their cage. Makes it much easier to catch them. It is rare ours gets out, but when an exercise ball starts to get older, the top pops off easier, so they will roam around - but ours will often just walk over to us and climb on our laps - they are too spoiled to care about adventure. That is also a way to get a new hedgie to know you. Start putting the main caregivers worn t-shirt (no buttons or snaps or strings) in the cage with them to sleep with. They will know your scent and trust you faster. Then rotate shirts of the next person that will be handling them the most into their cage. This lets them adjust to the new people and house smells when they fist come home, but also a bonding method. Hedgehogs bond with their owners. Our little chocolate baby hardly eats when my son is gone on vacation with his grandparents. I have to bribe her with treats to eat. Knowing what foods and snacks they like is good too, a sick hedgie or one that decides to be picky about their food will help you keep them eating. Most owners try to mix a few types of high quality cat foods together so they don't get tired of it so fast. Meat flavored baby food (chicken & turkey) are great for a hedgie that needs a little extra water. Use Spring Water in their water bowls and you can use it to lightly thin out the baby food too. Just not too much and make sure the food is room temperature. Since they only eat a little bit, you will have to put the left over in the refrigerator which makes it thicken up. Never feed them grapes or raisins - it can cause renal failure. Some hedgie books will say it is ok, but it is not!! Most veggies they are offered should be cooked. There are some good websites that list all the ones you should make sure are cooked first - like sweet potatoes, a good source of fiber for them if they have some loose stools. Hedgehogs have a sweet tooth, so if you have one that needs an energy boost after being sick or dehydrated, a little honey in some warm water (put in a bowl if possible or bottle rather than a syringe) will work wonders for them. They love the smell of chocolate too, but never let them eat it. Also, dried mealworms can get stuck in their throats (choke), or scratch their throats (infection), or cause problems in their stomachs. Live worms are the best and safest, keep them smaller, especially if the hedgie is a baby. Waxworms are too large. Crickets can be too. So always watch them when they eat live bugs too. If they look like they are not swallowing and may drool some bug back out, just lightly rub their throat with a finger and they will usually swallow the bug (ours tried to eat 3 at once) or throw it back up. She was too excited about her mealies. But a light touch is all that is needed, so don't panic and just be gentle with them. Just a few things we have found out from experience or from talking to other hedgie owners but it doesn't show up in books, so I thought I'd add it here for you. Hedgehogs are not really good for kids under 8, OR for people that are a little rough. They are small and fragile creatures, so you have to be very gentle and loving with them. 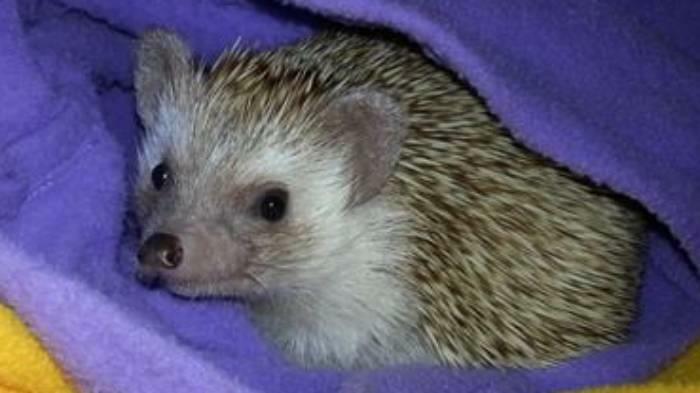 Treat them like a precious baby and you will be the much loved Hoomin (Human in hedgie talk) of a wonderful pet.